We investigate conserved genetic mechanisms that control vertebrate embryogenesis by focusing on a conserved family of zinc-finger transcription factor genes, the Zinc-Finger-in-the-Cerebellum (Zic) family. Zics are essential for normal brain morphogenesis in mammals; in humans, mutations in Zic1 are associated with cerebellar malformations, and mutations in Zic2 are associated with holoprosencephaly, the most prevalent congenital malformation of the cerebral cortex. 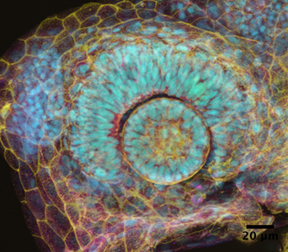 We use an experimentally accessible model organism, the zebrafish (Danio rerio), to elucidate the mechanisms of Zic function in the developing embryo. By leveraging the unique strengths of zebrafish, i.e. 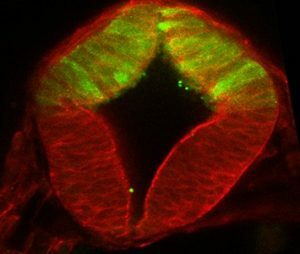 the ease of direct observation and genetic manipulation, we have identified novel roles for Zic2 in two essential signaling pathways widely used during development, the Wnt and Hedgehog pathways. We have identified key roles for Zic2 during brain morphogenesis as well as the formation of the neural retina/brain interface and of the adjacent craniofacial cartilages that form frontonasal and jaw structures. With robust mutant-based models in hand, we are working to gain an in-depth understanding of the important, yet poorly understood mechanisms that underlie conserved requirements for Zic function during vertebrate embryogenesis.